The charter boat, Bezo, and their catches depicted on this site are from the late 1920’s and 1930’s. They are all that remain of the many photos taken at the Pier 5 docks in Miami, now known as Bayside. Pier 5, as it was built originally, was destroyed by a hurricane and rebuilt several times before it looks as it does today. Jesse Conyne, the owner of the Bezo, was my great, great, great Uncle on my mother’s side. Jesse and his wife, Marie, moved to Miami in 1927 from Chicago, Illinois. Jesse had Bezo built in New York and brought it down the Intracoastal Waterway to begin his charter business in Miami, Florida. I am not sure when he died exactly or how long he owned the Bezo, as my grandmother only saved a few dozen pictures. What you see is all that’s left. Jesse died before my mother was born in the late 1950’s. My Aunt Marie Conyne lived in their house on 1st Avenue in Downtown Miami until the late 1970’s. Marie would walk my mother to Pier 5 and buy her fresh fish in the early 1960’s. Unfortunately, Marie died while my mother was very young and she did not get to hear any of the great Bezo stories. Jesse and Marie didn’t have any biological children. They had a sort of adopted son Russell, that Jesse took under his wing and taught him the in’s and out’s of charter fishing. He fished with Jesse for many years before he died in a car accident. The stories that I have gathered from family members are that Jesse Conyne fished many important politician and business moguls. In those days, as you can see from the photos, it was a rich mans sport. 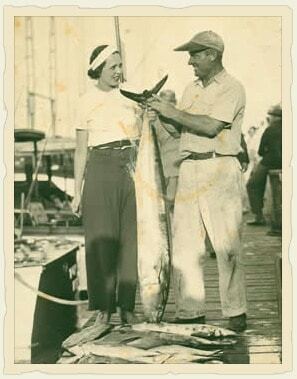 My grandparents David and Lois Ide were avid fisherman while they lived in Rhode Island. They loved the sport and fished tuna tournaments year after year. My father grew up underneath one or another of the many boats they had during the winter months. They moved the whole family to Fort Lauderdale in the dead of winter of 1968. Growing up on the New River, my father fished billfish tournaments with the late Sol Spiegel when he was a teenager. I was raised on the New River here in the heart of Fort Lauderdale, following my family’s footsteps. Fishing has been my passion and always will be. So now you know why I love to fish. It’s in my genes and under my skin.